Hip dysplasia in dogs happens when the ball and socket joint of the hips doesn’t develop properly, which can result in lameness and painful arthritis. In fact, hip dysplasia is the leading cause of lameness in the rear legs of dogs, especially in large breeds such as Newfoundlands, Saint Bernards, Chesapeake Bay Retrievers, and German Shepherds. 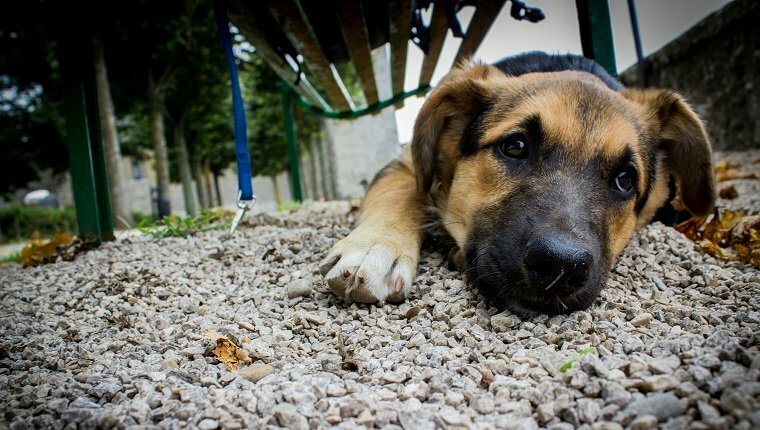 It’s estimated that 20 to 40 percent of large-breed dogs are afflicted. Even more heartbreaking, this genetic condition can onset from birth, rendering some very young dogs lame. For others, it’s a long road toward less and less mobility, as the deformed hip joint causes bones to rub and grind instead of smoothly sliding. But for many dogs there are ways to treat, prevent, or at least lessen the impact of hip dysplasia. Here is what you should know about the symptoms, causes, and treatments for hip dysplasia in dogs. In dogs born with hip dysplasia, hip development may appear normal at first. However, the first sign of a problem typically arises when the dog is as young as four months to a year. Dogs may begin to show signs of pain in the hips when walking or running. Their gait may change, they may have difficulty standing up, and when you press down on the rump you may see the pelvis drop. Due to the abnormal wear and tear of the hip joint, the condition may deteriorate progressively as the dog’s skeletal system fully develops. In the worst cases, it can prohibit the dog from walking. They may resist physical activity, suffer from hind-limb lameness that may be intermittent or persistent, or have an unusual stance. Eventually, muscle mass may be lost in the thighs and the shoulder muscles may become enlarged as the dog shifts their weight to the front legs. Hip dysplasia in dogs is a hereditary bone and joint disorder that causes abnormal hip joint development, though environmental factors also contribute to the development and progression of the condition. Large and giant breed dogs are especially genetically predisposed to developing hip dysplasia. The design, structure, and functionality of the canine hip are all strikingly similar to that of a human. The hip is a ball-and-socket joint: the ball is the round head of the femur (thighbone) and the acetabulum (socket) is the concave indentation of the pelvis. In a normal hip, the smooth, rounded head of the femur fits deeply and snugly into the acetabulum. Durable ligaments allow for a wide range of motion and collectively hold the joint together. In a dysplastic hip, the head of the femur fits loosely or — depending upon the severity of the condition — it may be entirely dislocated from the socket. The bone separating from the joint causes friction and, as the condition worsens, painful arthritis. Some factors that can affect the condition include weight gain and obesity, poor diet, and pelvic muscle mass. Excessive growth and exercise can also worsen the condition. 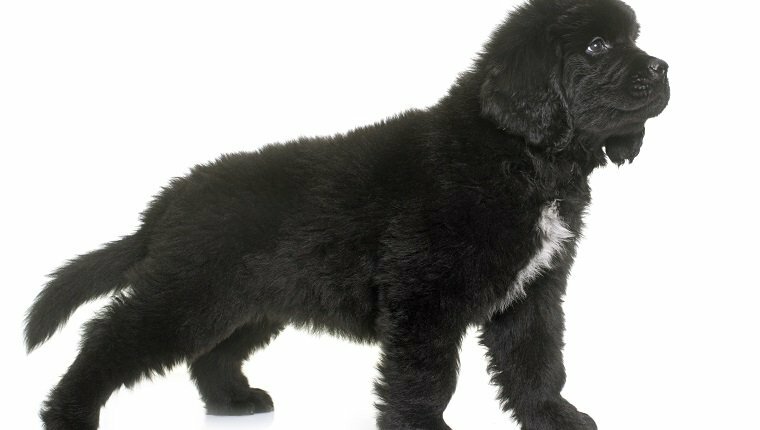 Certain diets formulated for large breed puppies can help prevent excessive growth. You should ask your veterinarian about an appropriate diet for your large breed dog. If you notice your dog having difficulty with normal walking or running activities over a period of time (not just for a day or two), it’s time to see a veterinarian for a proper diagnosis. The only foolproof method of diagnosing hip dysplasia in your pet is through an X-ray of the hip and pelvis to examine the hip structure. Because a puppy born with a genetic predisposition to hip dysplasia will appear to have normal hips in the early stages of development, your vet will likely advise waiting until the age of two for a full X-ray examination. Of course each situation is different, so ask your vet as soon as you notice a problem. Taking an effective X-ray that allows the vet to make a proper diagnosis will require your dog to be heavily sedated or anesthetized. Excellent. 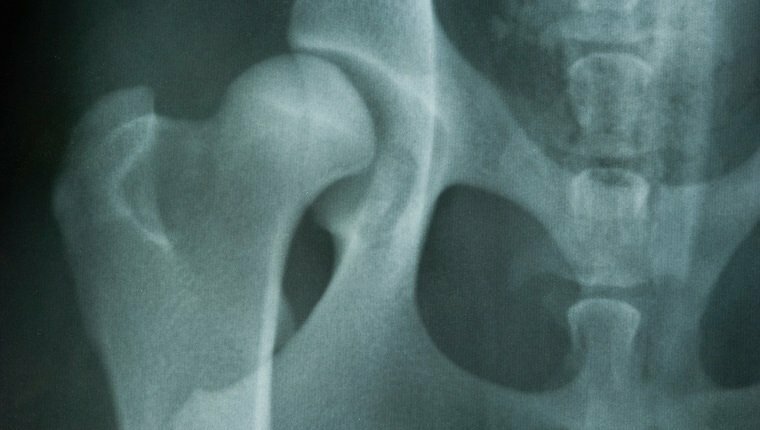 The hip is normal and fully operational; the femoral head fits tightly into a well-formed hip socket with minimal space between the head of the femur and the acetabulum. Mild hip dysplasia. The distance between the ball and socket of the hip increases as the ligaments that hold them together develop tears and begin to stretch, reducing the stability of the joint. Moderate dysplasia. The rounded femur head barely rests inside the socket and arthritic changes become evident, such as partial or occasional lameness, or pain when running or moving. Severe dysplasia. The head of the femur is completely dislocated from the joint. The dog may be unable to walk, or only with great difficulty. It’s difficult to outline a “typical” course of treatment for hip dysplasia in dogs even after the condition has been diagnosed because there is such a range of possible severity of the problem. Treatments vary from modified diet and exercise routines to surgical procedures such as hip replacements — which, as you can imagine, are highly invasive and require long recovery times. However, in some puppies early surgery can help prevent degenerative joint disease. And for dogs older than nine months, new advances in total hip replacement (replacing the old joint with a new, artificial one) have led to extraordinary recoveries in as many as 95 percent of cases. In a less severe case, your vet may prescribe anti-inflammatory medication and perhaps the use of Adequan, a drug that can relieve pain and inflammation and help repair damaged cartilage. They may also recommend weight loss to reduce strain on the joints, exercise restriction, avoiding walking on hard surfaces, and physical therapy. One way that breeders prevent hip dysplasia in dogs is selective breeding. Obviously, this is also the one option that is off the table for owners of an affected dog, but there many steps that can help keep the condition under control. Proper care can actually delay the onset of hip dysplasia in dogs that are genetically predisposed, perhaps resulting in a less severe form of the disease. In the best scenario, your dog may never develop any clinical symptoms. Here are some possible ways to help reduce the severity or even prevent hip dysplasia in dogs. Proper weight management is critical. Excess weight puts undue stress on the hip joints, so be well versed in the proper amount of food for your dog’s breed and age (this varies greatly according to your dog’s food and diet). 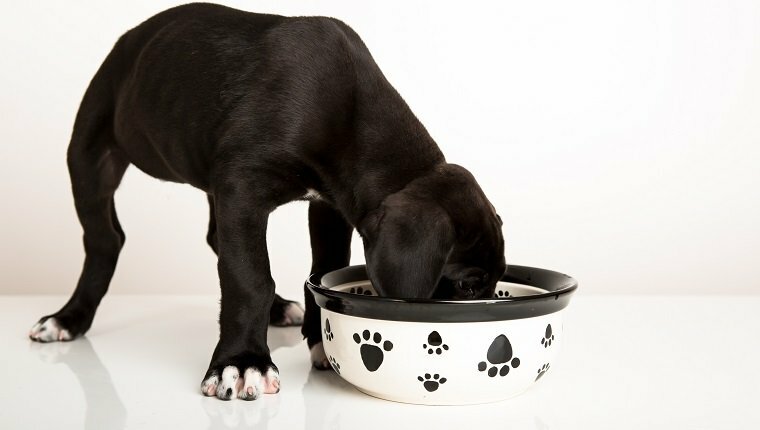 Puppyhood provides special challenges for weight gain. Because it’s such a critical time for bone and joint development, you must take special care to ensure that your dog does not gain too much weight. The best place to start is with a healthy diet that provides proper nutrition without requiring excessive amounts per serving. It’s a great time to train yourself that offering table scraps is not a good habit. During stages of rapid bone growth, discourage young puppies from jumping from heights or standing on their hind legs, as it simply puts too much stress on the joints. If your dog is experiencing lameness, it’s important to keep him on a leash and not allow him to run or jump as he plays. Swimming is wonderful exercise for a dog with hip dysplasia, because it allows him to build muscle mass without overstressing the joint. As dogs age, exercise remains very important, but you may need to adapt to your dog’s changing ability and mobility. There are several natural supplements and ingredients you can add to your dog’s food, such as glucosamine, that can help reduce the symptoms of hip dysplasia and arthritis. Does your dog suffer from hip dysplasia? What steps do you take to reduce their symptoms and keep them comfortable? Let us know in the comments below!